Studio physics, our new introductory physics courses at The University of Alabama, is a format that combines the lecture and laboratory parts of the physics class, doing away with traditional lectures. Our classes meet twice a week for 2 hours, and a third time for a single recitation hour. These meetings take place in a specially designed learning space where students have access to computers, electronic data-collecting apparatus, and three instructors. Instructors have access to video cameras, two LCD projectors, the Internet, and considerable software. In studio physics courses, students take an active role by performing experiments during instruction rather than waiting to apply their knowledge in separate labs. 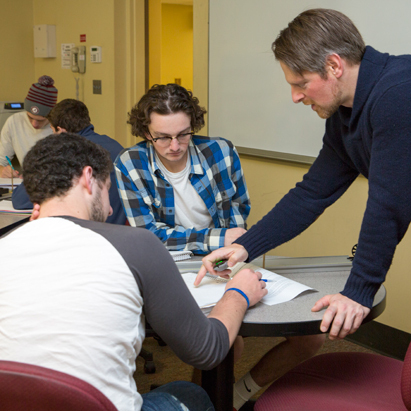 Here faculty member Dr. Matthias Kaminsky (right) assists students with an experiment demonstrating the concepts that he has just introduced. A typical studio physics class starts with a brief presentation by a professor on that day’s material. Students are expected to have read the material beforehand, and most faculty members have a brief quiz (i.e., Internet-based) before class to encourage this. After the presentation, students work in groups on a variety of activities, including pencil and paper worksheets, computer simulations, computer-based calculations, and experiments. The professor, a graduate assistant, and an undergraduate assistant move around the room to assist students one-on-one as they work through the activities. This is the ultimate in active learning, and it has proved to be successful at other universities. We have profited from discussions with faculty at RPI, North Carolina State, Dickinson, Tufts, and Arizona State, among other institutions, in putting together our curriculum. So far, we have data showing that class attendance is up dramatically, and that learning is also up. We think these two are correlated. Student attitudes are generally positive, although some students think they are not being “taught” if we do not lecture them for the full time. While this is understandable, when students mistake listening for learning, comparison of exams between studio and traditional sections show that these students are mistaken. On this website we have placed a PowerPoint presentation that summarizes the project, with a few photos. We also have a schedule of the curriculum, with links to activities and experiments. We also have a list of suggested sites for further information. Though this material is virtually all written locally, it has benefited from physics educators at many other institutions. We acknowledge their work, and ask that we be notified if we have inadvertently infringed on any copyrights. This work has been supported by the US Department of Education and The University of Alabama. Any opinions expressed here are the authors, and not those of either of these institutions.